Nashville Barker: Rumors about the “last voyage” of Sir Albus Manchild have circulated among afficionados for years. Tell us about how the diaries were actually found. Beston Barnett: They were in an old trunk in my grandmother’s attic. I have no idea how they got there: maybe her mother had been on a boat with him and their luggage got mixed up. If I had just googled his name I would have realized what they were – maybe given them to the British Library right away. Instead, I spent almost a year leafing through them, picking out bits of their melodies on my guitar. NB: Why did you choose to unveil these 100-year old melodies in such a modern form? NB: Composers from Ravel to Ellington have claimed Manchild as an influence. What would his influences have been? BB: I think Sir Albus saw himself as sort of removed from the stream of human accomplishment. He was classically trained of course, so he would have studied Bach, Mozart… but he tried to forget them, or at least to be equally open to the other sounds around him: birds, water, singing in the street. NB: And yet he has at times been accused of unrepentant plagiarism. BB: There was a childlike quality Sir Albus brought to composing. I think a blend of the romantic and the aristocrat made him disdain … dissecting his own inspirations. Squabbling over royalties was for lesser music-makers. NB: It’s even been suggested that these diaries themselves are forgeries – your attempt, perhaps, to ride on the coat-tails of Manchild’s resurgence? NB: When can we expect an appearance in Nashville? NB: There’s a guitar and there’s a story. Isn’t that all Nashvillians want? BB: I don’t know. Maybe. Curious Melodies is an interesting, even prophetic recording by guitarist Beston Barnett that combines intelligent musical composition with a fun fictional narrative, making a story that doubles as its own soundtrack. The overriding theme is the discovery of compositions by the fictitious widely traveled Sir Albus Manchild, a polymathic wanderer. A narrator introduces the musical document by introducing the enigmatic Manchild. The recording recounts the travels of the Knight of the Realm and the music that inspired his composition. Even if you’re not interested in the subtext of the story, the music is provocative and compelling. Beston chooses a Middle East motif that’s heavily accented with Hebraic influence and instrumentation. Beston plays a Django Reinhardt-inspired gypsy guitar, fronting a bass-drums rhythm section. Michael Schwartz sports a soprano saxophone that gives the music its most potent regional flavor. Each composition retains elements of the previous ones, providing a polyglot palette. This relatively small quartet has the ability to sound very large and full. It remains to be seen if the recorded marriage between music and narrative will be a marketable commodity. The music in these Curious Melodies is superbly composed and played, warranting a spin beneath the laser. The lost travel diaries of Sir Albus Manchild had been tucked away in an old trunk in Beston Barnett’s grandmother’s attic for many years, and their discovery led to this worthwhile project: an attempt to interpret these unfinished snippets logically. According to the story, Sir Albus Manchild (1842-1914) was a composer who traveled to America to research the blues and other vernacular forms in the new land. This Manchild was an eccentric Victorian composer. He traveled the world and sought out music from distant lands. It’s a fairy tale that contains many hopeful wishes. With each selection that Barnett’s quartet interprets here, the guitarist speaks at length about Manchild in an attempt to explain it all. His modern jazz quartet interpretation of Manchild’s music (from notes in his lost diaries) explores world music in the same way that Manchild himself did a hundred years ago. Acoustic guitar, acoustic bass, drums and a soprano saxophone give the music an exotic flavor that travels the world through its inherent connections. “Delola City” includes an early blues texture, but most of the material comes from distant lands. Sinbad the Sailor might have experienced some of these sounds. The same would apply to travelers such as Marco Polo and Christopher Columbus. Too bad none of them carried a tape recorder or a video camera. We can only guess what they heard on their travels. Today, we’re fortunate in that we’re able to take miniature recording devices with us everywhere we go. The music of Ghana, Guayaquil, Guiyang, Guangzhou, Guelmim or Goiania can be captured accurately without having to translate. Still, it’s fun to interpret foreign musical forms in our own musical language. Benson (sic) Barnett’s modern jazz retrospective provides one fascinating solution. Sir Albus Manchild, composer, linguist, and amateur lepidopterist, was not a trained ethnomusicologist in the modern sense: the melodies he scratched in his travel diaries were impressions or pastiches, often reflecting his mood of the moment more clearly than the local musics he so avidly pursued. Nevertheless, this song appears to have been at least partially transcribed directly from its performance in one of the historically boisterous weddings of Zautreg, which, as a stranger, Manchild would have heard from the outside, sitting on a doorstep or under an open window, his notebook open on his knees. The American colonies did not agree with Sir Albus; the insects were terrible, and he feared he had forgotten his own language, so difficult was it for him to understand the native’s feral English. Nonetheless, his exploration of the tobacco- and cotton-growing regions of the South was intrepid enough that he not only discovered its nascent blues idiom, but seems to have guessed the direction it would take. What was happening on the street corners and back alleys of Delola City bore little resemblance to the blues we know today, but it contained the seed – the blue note – and Manchild divined from that what strange fruit it would grow into. The diaries of Sir Albus brim with itineraries, amateur ethnographic sketches, romantic poetry, hand-drawn maps, and of course music, but the pages which should have been devoted to his time along the Gia Mang are strangely blank. This small mystery was made richer by the discovery of a single melody and the inscription, “whither your wings, angel,” still impressed 100 years later on the blank pages as if written hard on an earlier page. Or as if, moved by the singular beauty of a waitress approaching his table, he had frantically penned this melody and its inscription on a scrap of paper placed on top of the open notebook, and was afterwards made so disconsolate by her disdain for the indecipherable gift that he wrote nothing for weeks. Only conjecture of course, but every melody must mean something, must be made less torn from context. From his writings, we know that Manchild thought of music theory not in the Greek terms of ratios and intervals, nor in the almost kabbalistic number system of modern jazz, but in his own highly personal and emotional symbology. I contend that if we could understand his music theory minutely, we could hear in the recovered Gia Mang melody a desolate love poem, written on a napkin and thrust awkwardly into the hand of an improbable love. Sir Albus was not a sociable traveler. He prefered to see each new city sitting alone in a cafe on the plaza, exchanging a minimum of signs with the servers, even if the cafe were a mud-and-thatch hut serving redbush tea and the plaza, a dirt clearing in the center of some small African village. It is from such a vantage point that one imagines he first saw the now-vanished snake-whistle-dance performed by some children in Mmabandjouma. The snake-whistle itself was made from the young bush viper, a particularly poisonous and currently protected snake, which was killed and stretched out until rigor mortis set in, when finger holes could be cut out of the long stomach and a reed fixed in the jaws. Despite the otherwise solemn sight of a dozen barefoot children blowing into the mouths of snakes, the snake-whistle-dance was neither melancholy nor ecstatic. The music is simply happy because the player knows he has outlived the snake. Even a single note can be heard from at least two perspectives: there is the note and also the silence it punctures. As notes are combined, becoming melodies, counterpoints, progressions, movements, so perspectives multiply, impressions form as the music is compared to the body of sounds the listener has already heard and also the body of sounds yet to be encountered. Visualizations multiply as well, transforming a string of notes in that infinitely divisible space between the ears into a trembling dandelion, or a caravan driven across a shallow stream, or a lover glimpsed running through dark trees. On June 28, 1914 – the same day that Archduke Ferdinand was assassinated and Europe plunged into its first great war – the body of Sir Albus Manchild returned home to England. He died on the open sea, probably of malaria, on the last leg of a five-year odyssey of music. It’s clear that his thoughts were occupied with homecoming: the last melody written in the diaries seems to have been an attempt to recall the famous hymn, “Abide with Me”, though after the first most recognizable notes, it deviates considerably. “Abide with Me” played daily on the bells of Manchild’s hometown church in Lower Brixham, Devonshire – indeed the tune still rings over his grave there. That he was able to forget even a note speaks to the depth of his immersion in the musics of the outer world. The diaries themselves, whether misplaced or pilfered, did not get off the boat in England. Their travels have continued, from ship to ship, attic to attic, and now, from museum to museum, and yet, the travels of the curious melodies they contain are only beginning. 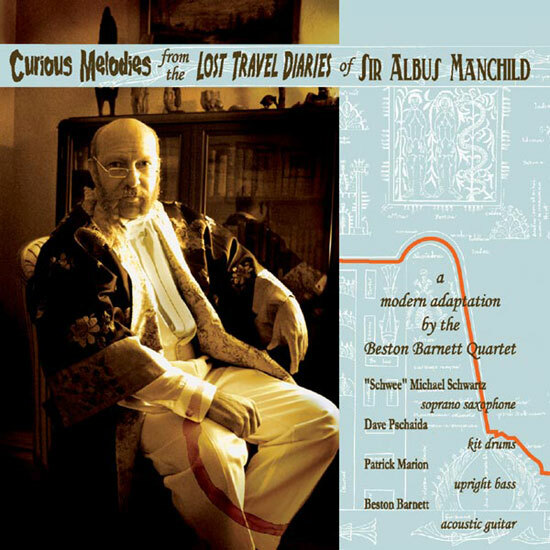 Categories: album, Curious Melodies from the Lost Travel Diaries of Sir Albus Manchild (2006) | Permalink.